Stories from around the Amish world that you may have missed, October edition (though some stories may be dated from earlier than October if I missed them as well 🙂 ). Church lunch, Amish and the 2020 election, Amish using Craigslist, and the question of whether the Amish are environmentalists are among the topics this month. Enjoy! A reader asked me recently about our church lunches. All church lunches are mostly the same, except the lunchmeat may be different or some may have cheese instead of cheese spread. Some might serve egg salad with no meat on the side. Always on the menu are bread, peanut butter spread, pickles, red beets, jelly or jam, butter, cookies, coffee and tea. The host can then add extras. I have sampled these post-service lunches on a number of occasions, in different states and groups of Amish. In my experience they have some variation, most obviously on which type of dessert is served (pies are common, with snitz the name of the game in Lancaster County, while other varieties are seen in Ohio and Indiana churches…though I’ve also gotten dessert bars in lieu of pie in New Order churches). There may also be a warm soup, but I haven’t had that often. Swartzentruber Amish are known to serve a bean soup. 2. Amish & The Ballot Box – As tends to be the case in election years, the Amish have been getting a spate of attention in the political context. We’ve already had a look at Amish PAC’s efforts in the latest election following up their involvement in the 2016 contest. 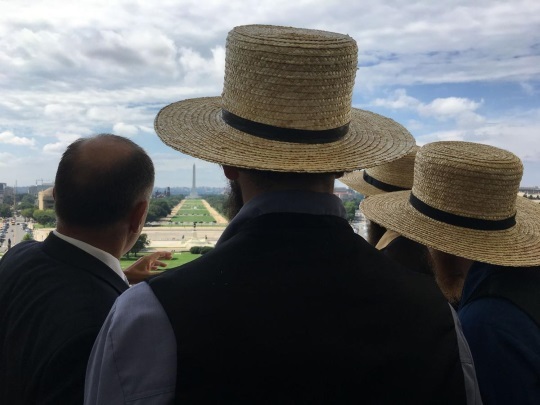 In other pieces, the Economist wonders if Amish will cast ballots in November, and Lloyd Smucker, the first Amish-born congressman, is profiled by Lancaster Online. 4. Shocking News, People Love Amish Donuts – It’s not stated explicitly that the delicious-looking things in the photo below are made by Amish (or just someone co-opting the name), but the description of the makers being from Punxsutawney – home of a sizeable Amish community – being brought there by drivers, and the hand-lettered Amish-looking sign advertising the treats all suggest the makers are in fact Amish (though Amish usually don’t promote their products as “Amish”). That aside, maybe it doesn’t matter given the long lines and happy customers of this business which sells from a temporary location on Saturdays in a Pittsburgh exurb, suggesting these are some mighty tasty treats. “People are here waiting. 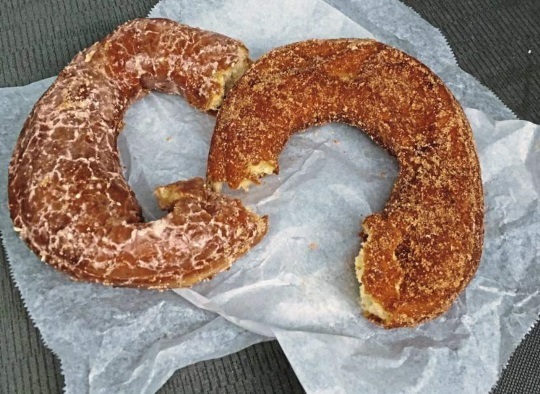 We get calls in the weeks leading up to them being here,” says the owner of the lot the group leases for their operation, where they make the donuts on-site. 5. Young Center Reopens – The Young Center has officially reopened after an extensive addition adding a lot more space to the facility. I had a chance to visit back in April after work had been completed. It’s been up and running for awhile but this was the official re-opening. Senior Scholar Steven Nolt say that the expansion offers more space for visiting researchers, while Director Jeff Bach adds that “We have more international researchers than we ever had in the 30 years we’ve been open.” This includes from places like Japan. “The Asian scholars are very curious about how these folks maintain tradition and what are the hallmarks of that,” says Bach. 6. Recalling Nickel Mines – For many October begins with a note of melancholy in remembrance of the victims of the Nickel Mines schools shooting, which happened on the second day of the month, twelve years ago. Hard to believe it’s been so long. 7. The Amish are not Environmentalists – Are Amish as “green” as some people seem to imagine them? 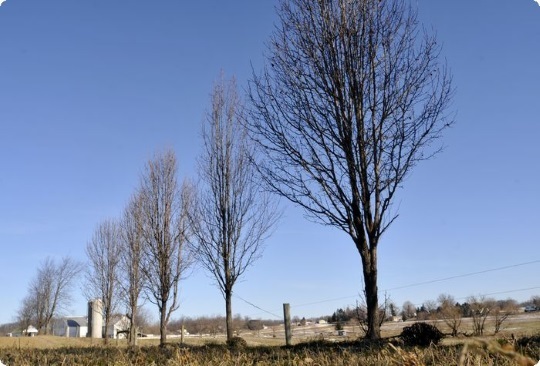 David McConnell of the College of Wooster takes on this topic in an article discussing his new book Nature and the Environment in Amish Life, co-written with Marilyn Loveless. Today’s Amish brand, whether attached to furniture, quilts or fresh produce, has become synonymous with a rural, wholesome and authentic lifestyle. And because many outsiders view the Amish as closely tied to the land, distancing themselves from modern conveniences, they naturally assume that the Amish embrace an environmentally minded lifestyle. We were curious about how this prevailing notion of the back-to-nature, environmentally conscious Amish fit with their biblical understandings and with the changing realities of their lives. Drawing on our respective training in cultural anthropology and ecology, we spent the last seven years exploring Amish engagements with nature from multiple angles. In our new book, “Nature and the Environment in Amish Life,” we argue that while there is considerable diversity across Amish groups and regions, they generally regard nature as being specifically created by God for human use. Their responses to regional and global environmental issues, such as watershed pollution and climate change, also reveal a deep skepticism of environmentalism and the regulatory state. Amish interactions with nature raise the question of the relative importance of intention and outcome as components of an ecological worldview. “I can’t ever remember being taught by my parents about the ecological value of nature,” one young man reflected. Most Amish practices that look ecological are better understood as a by-product of their religious and cultural worldview. 8. Return of Return to Amish – Years after Amish Mafia and Breaking Amish were making regular headlines, “Amish reality TV” is still a thing apparently, with Return to Amish, a Breaking Amish spinoff, back soon for another season. I don’t know what to add here other than, at least the heyday of this program seems to be in the rear view mirror. The people on these shows appear to have ongoing issues which they and the show’s producers have no qualms about displaying to the world in order to make another buck. Well it’s a free country after all. I live in PA…Mercer Co. We have many Amish communities. Amish auctions are very popular here!..and the food they sell at them is delicious..to say the least. Yep..that includes doughnuts!! There is never anything like taking a ride through our beautiful country side …stopping at an Amish vegetable stand..often self-serve….or seeing a sign at an Amish dwelling that says fresh doughnuts (they are huge). Along with white fences, hung clothes out drying using a pulley…Little ones out playing..often in their barefeet, and this time of year you may find homemade cider to go with those delicious doughnuts! Thanks for sharing that Judith – I was there just once to one settlement (short on time that day) but I think with the abundance of Amish communities in that county it would be a really nice place to live. Love stopping at random Amish stands on a drive through the countryside like you describe.